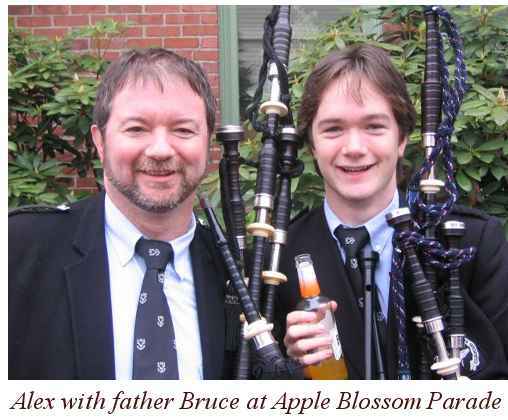 Alex Gandy was born in 1988 to prominent piping parents, Bruce and Bev (Rollo) Gandy. He spent some of his early years in Oshawa, Ontario before moving to Summerside, PEI when his father accepted a job at the College of Piping. Four years later, the family moved to Dartmouth, Nova Scotia where they have been living since 2001. He is currently finishing Grade 12 at Auburn Drive High School, and was on the honours and principal’s lists last semester. In addition to playing bagpipes, Alex enjoys playing guitar, snowboarding, and playing video games. "My dad grew up in Victoria, B.C.," Alex explains. "He is now the chief instructor of piping at the Halifax Citadel School of Piping. He has won too many prizes to list, gold medals and such. My mother grew up in Toronto, Ontario and is a legal secretary. She was a professional level solo player and played with the 78th Fraser Highlanders in the 80’s until she got pregnant with me. My younger brother Fraser is currently learning how to play the snare drum with the 78th Highlanders School of Piping and Drumming. Both of my grandfathers also played the pipes. My Grandpa Gandy played the set of pipes my dad plays now and my Grandpa Rollo still plays a set of pre-1900 MacDougalls." Alex’s first lessons were taken from John MacPhee when he was playing in the College of Piping Pipe Band in Summerside, PEI. "But most of my teaching has come from my dad," Alex continues. "Willie McCallum taught me a lot when I was able to get lessons from him, and my grandpa, Ron Rollo teaches me every time I’m in Ontario visiting. As a piper I think I play most things in the style of my dad. It’s kind of hard not to when I’ve been hearing him play since before I can remember. "I attended the Ontario School of Piping summer camps at St. Andrew’s College in Aurora, Ontario several times and they were amazing. I got to meet all sorts of piping heroes, Angus MacColl, Willie McCallum, Alasdair Gillies, all of the people I knew were incredible pipers from hearing stories and knowing they could beat my dad, which, when I was younger, was the scale upon which I judged everything piping." His teachers may have impressed Alex, but the feelings seem to have been mutual. "My impression of Alex is that he has a natural talent and understanding of how to play highland bagpipe music," says Willie McCallum, of Scotland. "In a teaching sense, he is easy to work with in that he can grasp exactly what you are trying to get him to do, which is important especially when a piper reaches the level he has. The changes you are making are usually very small and subtle and sometimes these are the hardest things to change. He also has a hunger to become a better piper and, as he matures, that will happen as long as he maintains that desire to play as well as he can at all times. His dad certainly helps that side. He has fun doing this thing and that has to be a must for anyone who wants to succeed, and is very much a credit to his family." "I have watched Alex from birth," says Ken Eller (see Celtic Heritage, June/July, 1995), family friend and former pipe major of the legendary Clan MacFarlane Pipe Band, "or should I say his birthright, and now it is coming to fruition. He is a remarkable, mature young man destined to make his mark on piping and people in general. He has the work ethic and loves the instrument beyond imagination. My wishes for him are nothing but fabulous music and a lifetime of enjoyment. I think Alex has as much potential as any player in recent memory: not only talent, but also the personality and humility to make him a champion. Following his progress through his youth has been an adventure of magnitude, but the pundits will have a larger feast as he approaches those great years ahead of him. I anticipate a superb musical career for Alex that might very well outshine his father and that is a monument to the family and the guidance he has had along the way." Alex’s first influential pipe band experience was with the Dartmouth and District band. "I played with them when I was 13 years old and in grade 2 solo competitions," he explains. "Mr. James Bain was the pipe major and he taught me a lot. He was extremely nice and never had a bad thing to say, and was a great leader." Most of his band experience since Dartmouth, however, has been with the 78th Highlanders (Halifax Citadel) Pipe band, and the upcoming season will be his 4th with the band. "In my time with the band we have done many major things, such as winning the Grade I North American Championships at Maxville in 2003, and getting through to the finals and becoming one of the top 13 bands in the world in 2005, as well as putting on an excellent concert in Halifax last June 1st." "Its been great to watch Alex's development over the few years he's been in the band," says the 78 Highlanders’ pipe major, Roderick MacLean. "He's always had great technique and now he's consistently coming out with a bagpipe that will serve him well at the professional level. I've always thought that the most striking thing about Alex's playing is that it seems to come out so naturally. Obviously, this is the result of a lot of hard work on his part but with Alex you get the feeling that there's something extra there, that the music is coming from inside him and isn't at all manufactured. He's already had a great deal of success competitively and will undoubtedly have more if he continues to work at it. I've very much appreciated his contribution to the band since he's joined. Alex is an intelligent young man with a penetrating sense of humour, which I've been the victim of once or twice! His approach to the group, however, is a very mature one especially for someone of his age. He's come to be someone I rely on - which is about as high a compliment as a pipe major can make I think." Alex is not only a band piper, by any stretch of the imagination. He has been a consistent winner of Grade I prizes at most of the contests across the Maritimes. While in Scotland in July and August of 2005, Alex came 2nd at the MacGregor Memorial contest in Oban, and won prizes in the light music at Perth and Taynuilt. In October he came 2nd overall at the Nicol-Brown Invitational Competition in Troy, New York and in November he was the overall winner at the George Sherriff Memorial Invitational in Hamilton, Ontario, winning the MSR portion at both contests. 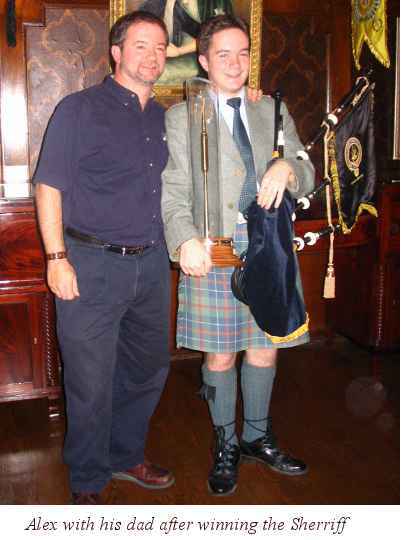 In February 2006 he won the Amateur Piobaireachd and came 2nd in the MSR at the Metro Cup, held in New Jersey. Recently, after moving into the Professional class, Alex placed 4th in the Professional Jigs at the B.C. Indoor, with 22 pipers playing. "I would say my highest achievement would be winning the George Sherriff," Alex says proudly, "or coming 2nd at the MacGregor." Both were wonderful achievements for such a young piper. "The most memorable thing I’ve done because of piping is to travel to all of these foreign places. I’ve been to New York City and Colorado, all the way across Canada, and to Scotland and England." "Right now, I am playing the set of 2005 McCallum bagpipes that I won at the George Sherriff. Before that, I had been playing a set of McCallum’s from 2000. I play a McCallum chanter with a Troy chanter reed, and Ezeedrone drone reeds." This year, Alex began apprentice judging, and has shadow judged with his father and with Roderick MacLeod, both members of the ACPBA adjudicators’ panel. He has taught piping through his band’s school, and has had students come to him for private lessons. "I don’t have any regular students at the moment," Alex says, "and I am midway through getting my teacher’s certificate through the Institute of Piping. "As for composing, my dad taught me all of the music theory I know, but I haven’t composed enough tunes yet to see if his style of writing has rubbed off on me. He has included a couple of my tunes in his most recent book, Contemporary and Traditional Music for the Highland Bagpipe, Volume Four. The tunes are "The Deeside Ranch" which is the name of my grandparents’ house, and "Summer at the Johnston’s" which I wrote for my friend Finlay and his family who took me in when I was in Scotland for five weeks last summer." Alex has been recorded several times. "I was aired on PlanetPipe, the Internet radio show produced in Scotland. They played my MSR from the George Sherriff. Most recently, I played in a recital in Victoria, B.C. with Roddy MacLeod, and that was a whole lot of fun, but very nerve-racking at the same time. I was recorded during that as well." Because Alex is just 17 years old, he can see things from a young person’s perspective. "My advice to other young players is to practice a lot. I was one of those kids that tried to get by without picking my pipes up at home, and it worked until I got to about Grade 4 and 3 but I realized I wasn’t going to keep winning things, so I had to get going. Definitely play your exercises. Pick up Jim McGillivray’s book, Rhythmic Fingerwork, which has every exercise you will ever need. 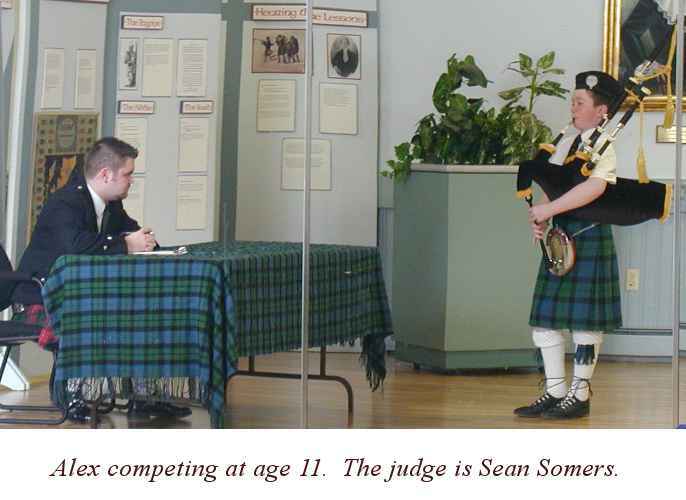 I would like to see more pipers in the Maritimes competing in solo competitions, and there are definitely not enough pipers involved in Piobaireachd." "Alex is beyond a doubt the next shining star on the piping horizon," says Ken Eller, "so, let’s all be patient and watch the progress. The Highland Society of London will know Alex Gandy well before his career is over."